Magnum are Tony Clarkin on guitars, Bob Catley on vocals, Al Barrie on bass, Rick Benton on keyboards and Lee Morris on drums. There are two changes since the previous Belfast show with former keyboard player Mark Stanway departing in December 2016 and Thunder drummer Harry James leaving due to scheduling issues. Magnum, who regularly breached the Top 40 of both the singles and album charts in the Eighties and early Nineties, came together in the Midlands in the mid-Seventies and released their debut album 'Kingdom Of Madness' in 1978, followed by 'Magnum II' in 1979 and their first live album 'Marauder' in 1980. During this period they toured relentlessly with the likes of Def Leppard, Blue Oyster Cult and Judas Priest. 1982's 'Chase The Dragon' album was the first to go Top 20, and was accompanied by a sold out UK tour. 1983's 'The Eleventh Hour', 1985's 'On A Storyteller's Night' and 1986's (Roger Taylor produced) 'Vigilante' album all fared similarly well but it was 1988's 'Wings Of Heaven' LP which really broke the band into the mainstream, going gold, breaching the top 5 of the UK chart and spawning three top 30 singles - 'Days Of No Trust', Start Talkin' Love' and 'It Must Have Been Love'. During this period the band regularly graced the stages of such venues as Hammersmith Odeon and major UK Festivals as Reading and Castle Donington. 1990's 'Goodnight To L.A.' album also went Top 10, spawned the Top 40 single 'Rocking Chair' and was accompanied by a tour of the UK's Arena circuit, including venues such as Wembley Arena and the NEC. 1991's 'The Spirit', 1992's 'Sleepwalking' and 1994’s 'Rock Art', were followed by the announcement of the band’s demise and an extensive farewell tour, during which the band's 1996 live album, 'The Last Dance' was recorded. 2004’s ‘Brand New Morning’ album was an even more accomplished body of work, and won over a host of new fans, as well documented on the ‘Livin’ The Dream’ live DVD, recorded in the UK in 2005, and released in 2006. Both ‘Princess Alice and The Broken Arrow’, released in March 2007, and ‘Into The Valley Of The Moon King’ Magnum’s 2009 studio album, proved how, like a good wine, this band just gets better with every year. With ‘On The 13th Day’, the cover of which was once again created by famous fantasy artist Rodney Matthews (Asia, Nazareth, Eloy), Magnum more than stepped up to the plate to deliver an even more accomplished body of work than ever before! "Escape from the Shadow Garden" was released March 2014 and followed by a UK & EU tour. 'Sacred Blood "Divine" Lies' in 2016 also debuted at number 2 in the Rock & Metal chart and at number 6 in the Indie chart on release by Steamhammer / SPV. It is a notably heavier, harder offering than its much acclaimed predecessor, 'Escape From The Shadow Garden', and is packed with even more of Magnum's massive trademark rousing rock melodies. The artwork came once again from Rodney Matthews and the release came with bonus videos and bonus tracks. It was followed by an extensive 33 date 2016 tour in EU, UK & Ireland and then again a Winter tour appearing at a select few UK & Irish venues. After a conversation between Tony and his daughter discussing all the ballads the band had in the catalogue, thought turned to re-releasing in some way an album full of Magnum ballads? Tony talked to SPV and they agreed. This turned out to be a longer process than anticipated. As once again Magnum were not just going to release old songs in a new guise, many songs undertook a lot of treatment to remix, re-master and even re-record complete songs. The new Ballads album titles “Valley of Tears” was released 6th January 2017. Summer 2017 sees Magnum once again return to the M2 studios to start work on the next studio album. While the band continue to appear around the mainland EU and the UK festival circuit the band continue to record. 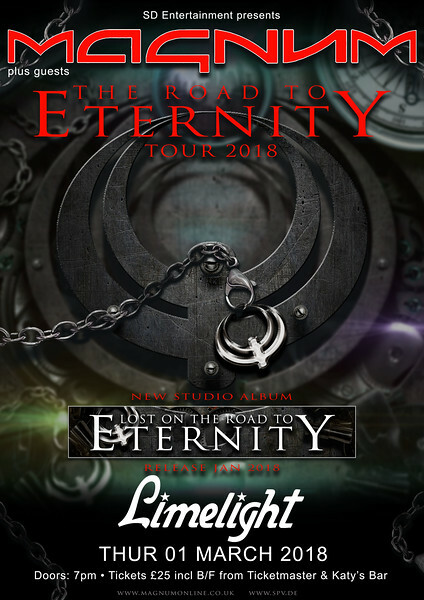 The new album titled "Lost On The Road To Eternity" is provisionally set for release for January 2018. This will once again be followed up by an extensive tour. As usual Rodney Matthews has been commissioned to do the cover artwork.